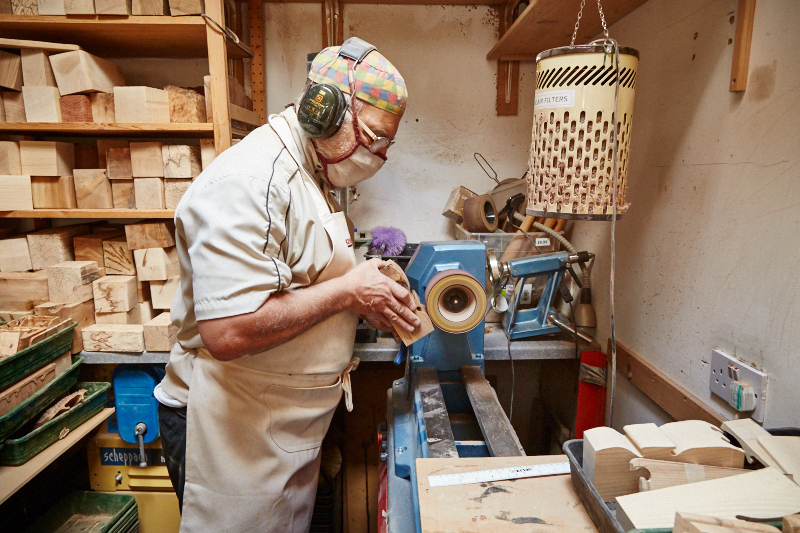 Ray Sylvester makes wooden boxes – “bloomin clever boxes” as he and his wife Kathy describe them on their web site. Ray’s boxes are the kind of intriguing gift that is a cross between those wooden puzzles you get as Christmas gifts and a 3D jig-saw. The pieces slots together in a certain order and reveal hidden compartments as you remove them one by one. The boxes are “bloomin clever” in their design and the attractive wood grain makes them pleasing to look at. The really clever thing is how they are made. The mechanics of the process have been developed by Ray over many years and his workshop is organised around box production. The pieces are cut on one of several band saws then smoothed using different woodworking tools. 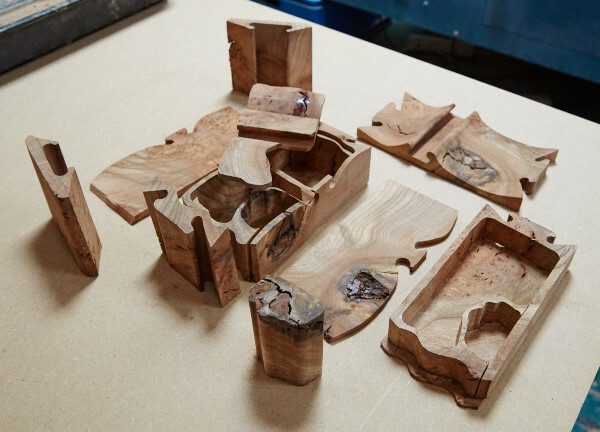 They are then hand finished to bring out the beauty of the wood and the various interior compartments are then lined. It’s only when you see Ray at work, as I did recently, that you realise he’s the clever one. A band saw will cut any piece of wood while allowing you to guide it freehand. With skill you can follow a curved line and still end up with a full set of fingers and thumbs. 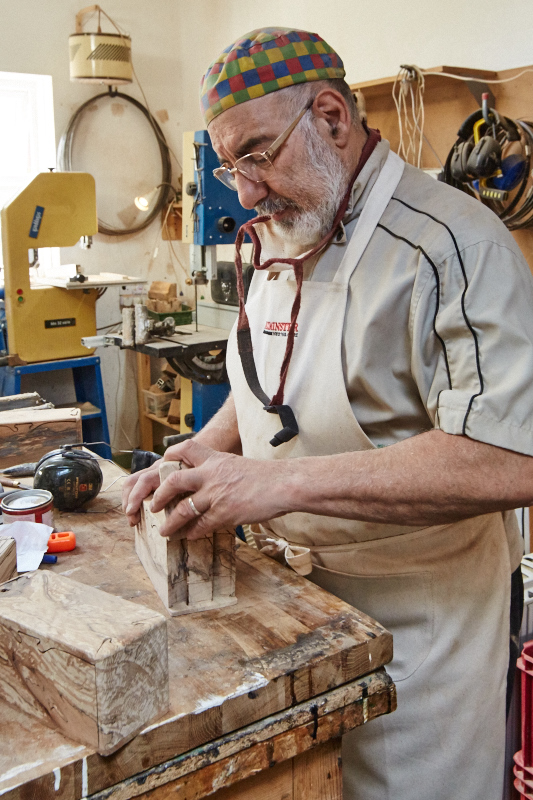 What Ray does when faced with a block of wood is to think how the finished article will work in three dimensions. 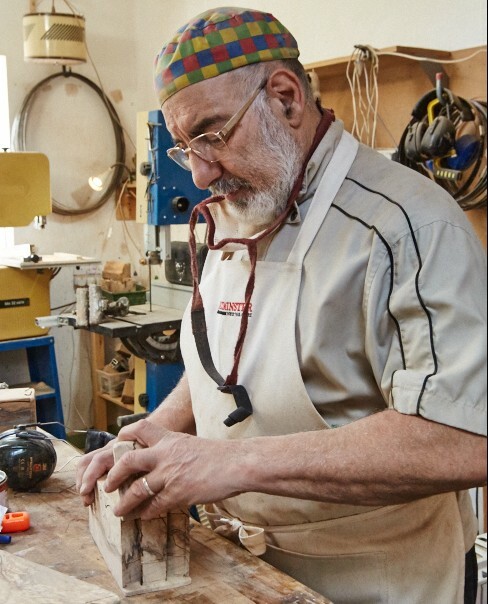 He takes into account the unique beauty of the wood grain and how it will appear when cut and polished. With this in mind he begins to cut the block in three dimensions to create a very intricate structure. The end result is a collection of parts that will slot together again to make the box. After Ray has finished smoothing and polishing the wood, and has lined each hidden compartment with green felt, he passes it on to Kathy to be marked on the base using pyrography. If you wish, Kathy will also add a personalised inscription to make it a very special gift. Ray and Kathy are members of the Peak District Artisans group www.peakdistrictartisans.co.uk which includes artists and craftspeople producing creative work in a variety of ways. What a wonderful description of a wonderful man. I have the honour of having one of Ray’s boxes which has enhanced my already extensive collection. It is truly a thing of beauty. Thank you David for sharing your experience and letting the world see into this remarkable gentleman’s work, he is very gifted and will be at the Ludlow Show at the end of November.